(called “The Anatomy of a Silent Crisis”) (29 May 2009). Kofi Annan, the president of the GHF, wrote the report introduction – “Message from the President” in which he makes the following statement: “Ninety-nine percent of all casualties occur in developing countries. A stark contrast to the one percent of global emissions attributable to some 50 of the least developed nations. If all countries were to pollute so little, there would be no climate change.” Annan’s blame it all on the U.S. approach neglects the reality. What the GHF and others neglect is that the local environmental problems in these “innocent” countries are the result of rampant population growth and the associated deforestation. 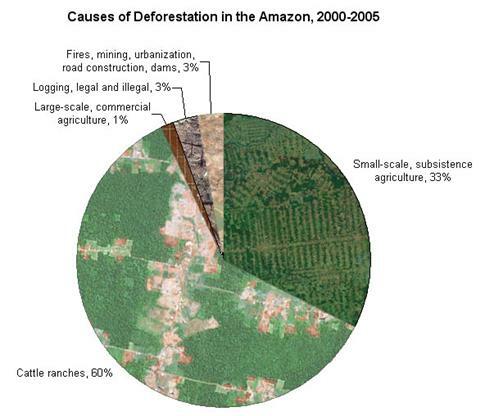 “Africa: Tackling deforestation is critical” [http://www.africanews.com/site/list_messages/14014]: “REDD acknowledged the need to fund the developing world's efforts to fight deforestation, but it was still unclear how this would be done, said Peter Frumhoff, main author of the IPCC Special Report on Land Use, Land-use Change and Forestry, and Director of Science and Policy at the Union of Concerned Scientists, a US-based nonprofit advocacy group. One of the options in the REDD programme is that countries fighting deforestation could be rewarded with carbon credits, which they could sell to rich countries to meet their emission targets. Under the Clean Development Mechanism, one of three options offered by the Kyoto Protocol, the industrialised world can use carbon credits to reach their emission reduction targets.” In other words Kyoto is not really about reducing CO2 – it is about transferring funds to “developing” countries. 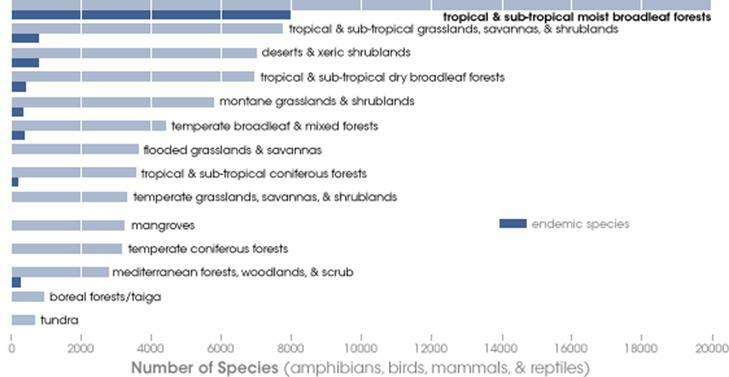 The following figures are from the UN FAO 2007 report on Africa’s forests [ftp://ftp.fao.org/docrep/fao/009/a0773e/a0773e02.pdf]. 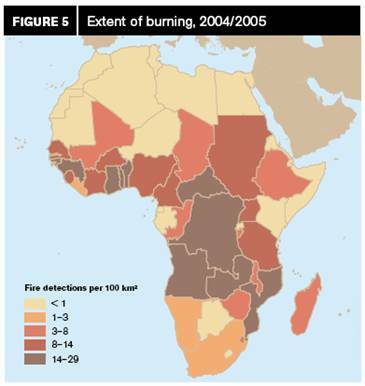 The left figure shows the extent of forest burning (as detected from satellite data). 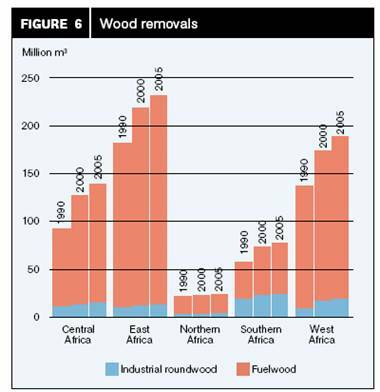 The right figure shows the increasing cutting of forests for fuelwood. These are very telling statements: “new energy and environmental policies are making woodfuel an essential ingredient of energy policy in both developed and developing countries”… and “increasing concern for climate change will result in increased use of wood as fuel in both developed and developing countries”. The environmental policies that are referred to are the anti-fossil-fuel policies, wherein the burning of wood is deemed preferable because it is “renewable biomass”. The fact that burning wood releases more greenhouse gases per unit of energy released than burning oil or natural gas does, is simply overlooked. 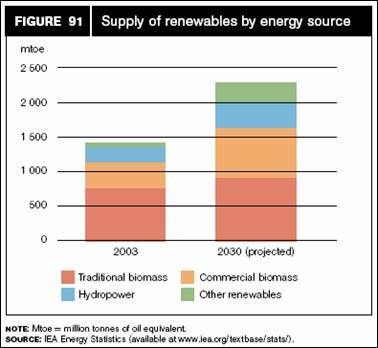 The following figure from the same report shows the expected increase in biomass burning as a source of energy. The U.S. can curb CO2 emissions all it wants – globally it will achieve nothing. 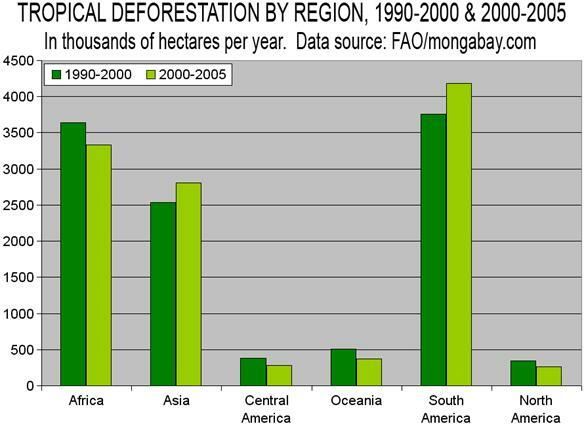 Kenya’s annual deforestation rate for 1990 – 2005: 12,000 ha / year (total remaining forest: 3.5 million ha). Population: 34 million (60 % rural), growth rate: 2.8 %, fertility rate (children / woman): 4.8, population doubling period: < 28 years. [http://rainforests.mongabay.com/20kenya.htm] (42 % < 14 years of age). 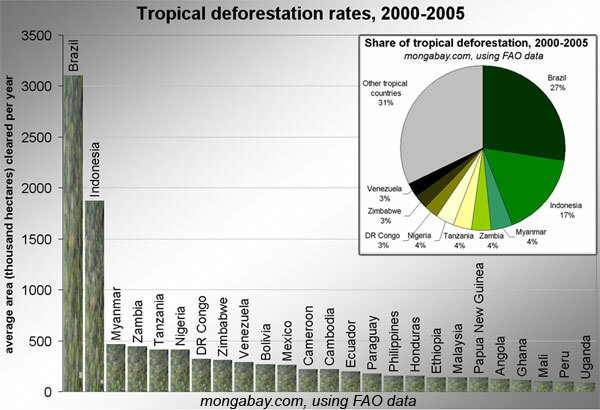 The following figure shows the deforestation around Tanzania’s Mt. Kilimanjaro. The following figure shows the net flux of carbon to the atmosphere due to land use change. 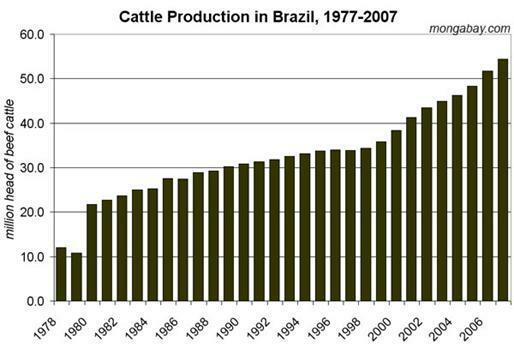 The United States has the largest land use change carbon sink in the world – i.e. while much of the world is burning its forests, the US is absorbing the carbon from the atmosphere. This figure shows: “Cumulative Emissions of C02 From Land-Use Change measures the total mass of carbon absorbed or emitted into the atmosphere between 1950 and 2000 as a result of man-made land use changes (e.g.- deforestation, shifting cultivation, vegetation re-growth on abandoned croplands and pastures). Positive values indicate a positive net flux ("source") of CO2; for these countries, carbon dioxide has been released into the atmosphere as a result of land-use change. 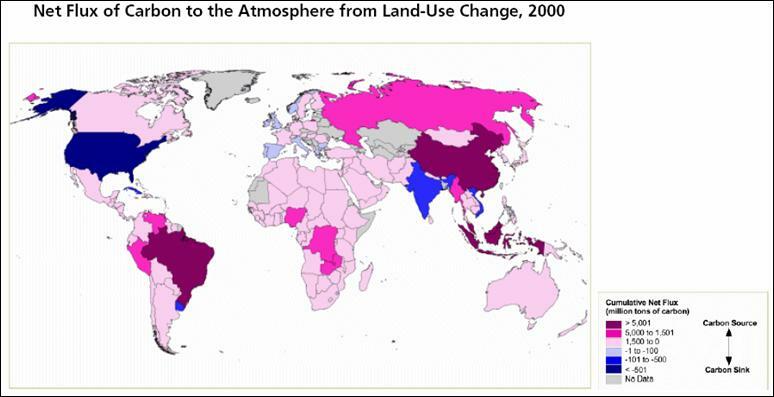 Negative values indicate a negative net flux ("sink") of CO2; in these countries, carbon has been absorbed as a result of the re-growth of previously removed vegetation.” [http://earthtrends.wri.org/pdf_library/maps/co2_landuse.pdf]. In May 2008 a tropical cyclone hit Myanmar (the worst since 1991) causing more than 20,000 deaths. The cyclone had deteriorated to category 1 by the time it hit the main populated city of Yangon [http://www.msnbc.msn.com/id/24478247/]. Al Gore appeared on that day on NPR to publicly blame it on global warming [http://www.businessandmedia.org/articles/2008/20080506160205.aspx]. The following figure shows Google satellite imagery for the area of Myanmar hit by the cyclone – the huge deforested areas are clearly visible. Even the Rainforest Foundation is smarter than the Global Humanitarian Foundation (or perhaps it’s just more honest).